“Does Labour need its own tea party?” asks the title of a post by Luke Bozier. I was hoping this would be an argument for some leftists to make extremist arguments, with the intention of shifting the Overton window leftwards. We must begin to admit that we were fiscally irresponsible for years, in order to gain the trust of the public again, at least on the economy. Not only is it important in order to win elections - fiscal responsibility is the right thing to do. Now, I’m no fan of Gordon Brown. But if there’s one thing he shouldn’t apologize for, it’s “fiscal irresponsibility.” My chart shows the story*. It shows that the public sector’s financial balance is very largely the mirror image of the corporate sector’s one. This shouldn’t be surprising, because for every borrower there must be a lender, and so across all sectors of the economy (which includes foreigners) net borrowing must be zero. The fiscal deficits of the mid-00s were, then, counterparts of a corporate surplus. And - I would add - the result of them. Companies’ reluctance to invest meant there was a tendency towards weak economic activity generally, which in turn added to government borrowing. I say that the causality runs from the corporate surplus to government deficit, rather than vice versa, for two reasons. First, the 00s were, generally, a time of low and falling real government bond yields. This is the exact opposite of what would have happened if high government borrowing had crowded out corporate spending. It is, though, consistent with a lack of demand to borrow - a lack of investment. Faced with firms’ reluctance to invest, budget deficits were pretty much inevitable. 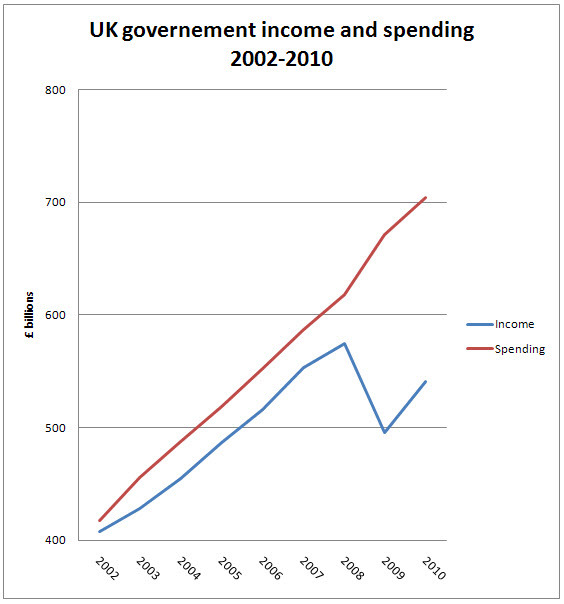 Had Labour tried to be “fiscally responsible” and cut spending or raised taxes, we’d have just had higher unemployment. Labour, then, shouldn’t apologize for the budget deficits. Yes, it spent badly. And yes, you could argue that it might have been better to have a mix of tighter fiscal policy and looser monetary policy - though as this would have exacerbated the housing bubble, this is arguable. But the deficits were the least of Labour’s sins. This said, I’ve nothing against telling lies for political purposes. But I’m not sure a false apology would promote Labour objectives. In the debased world we live in, “fiscal responsibility” does not mean higher taxes on the rich or a clampdown on the corporate welfare state created by slack procurement policies and addle-brained public-private partnerships. Instead, it means cuts in jobs and benefits. “Fiscal responsibility“ then, has the precise opposite to what I’d hoped Luke’s post would be about - it serves to shift the Overton window rightwards. * This should be familiar to regular readers. But as Luke doesn’t address it, it’s clearly not familiar enough. The large dip in your diagram corresponds with the QE program, presumably. Probably the worst of the Labour era fiscal crimes against future tax payers. The money did not exist, it was conjured into being on a promise from future generations with an assumption for growth. You seem to be saying that the money is actually being locked away with 'the rich' or 'companies', a very tired old Marxist line. Which I think is absurd. Why not admit that developing economies have pushed ahead, and Britain failed to compete. So we extended, pretended and fudged instead of responding with genuine adjustment? I'm not sure this works. You're arguing that since corporations were flush with cash, the Government might as well take advantage of that cheap money to spend on its own priorities? And that this was fine because it pushed up wages (lowered unemployment) right when there was a dearth of investment opportunities? It's true that there was an excess of cash floating round, and that that excess provided scope for people to invent ever more bizarre financial products in order that people could have something to do with their money. But Labour's fiscal policy was contingent on that excess lasting forever. That is Labour's mistake - not simply running a deficit, but running a deficit on the assumption that they'd abolished boom and bust. PeterM - I think you are confusing a lot of things, perhaps QE with public/private partnerships? Adam - I'm not sure the boom/bust has much to do with it. Japan's corporate sector has been in surplus for years now, the govt in deficit. Surely Chris is just pointing out that this is pure accounting - which is an MMT position I believe. If the corporate sector is hoarding cash, and the public are paying down debt, and the trade deficit continues, then there must be a public sector deficit. This is a zero-sum game. Which is why any policy that doesn't address the former is doomed to fail. Maybe it's the wrong graph?! Are you actually kidding? The Labour government ran up £200 billion of debt in an economic boom, at the same time as private consumers and companies were also running up massive debts. Instead of borrowing money they should have paid off our debt and actually tried to rebalance the economy away from debt and financial services. They didn't, instead they actually encouraged these things. They totally and utterly failed on the economy and left us wide open and exposed to one of the worst economic crises in a 100 years. They were even as arrogant and stupid as to believe their own propoganda that they had magically solved boom and bust. They were utterly incompetent. The concentration on government failure is fatuous. Compared to the failings of the finance sector Gordon Brown's 'profligacy' pales into insignificance. The most serious charge that can be laid against government - across the western world - is its acquiescence to the demands of 'the market', itself a result of the capture of the regulatory system by the acolytes of Ayn Rand. ALL governments that followed the neoliberal prescription are heavily in debt as a direct consequence of bailing out a banking sector which is not fit for purpose. The fact that the markets rigged by these operators are now blaming government for their woes, aided and abetted by credit ratings agencies that were rubber stamping the triple-AAA CDOs that precipitated the crisis just magnifies the farcical position of the right. And still the centre-left cringe in the face of their ludicrous revisionism. @ Stephen W - some cos ran up massive debts in the 00s, but overall they didn't. Net, then, firms were huge cashbuilders. Rather concerned that you have "nothing against telling lies for political purposes". One of the key criticisms of Labour supporters is that you think any means justify your oh so holy ends. Tony Blair routinely lied (just read Chris Mullin's diaries or even Blair's memoirs on North Ireland). Gordon Brown justified cosing up to Murdoch and the Daily Mail as the greater good would be served by him being PM. You just end up being revealed as untrustworthy hypocrites and your moral superiority is shown to be phoney. Labour use to be moral but wrong (economically), now you are showing why it descended to being wrong and immoral. Labour is a moral crusade or it is nothing - Bevan. Your kind of thinking shows it is nothing. Have you got a source for that graph? what would a similar chart for Germany look like? I think New Labour were terrible ( conniving at torture anyone? ) in numerous ways. But in my apology I would say that lying is what smart pols do, in their own minds it is clever to fool the ignorant voters to get the job done. And the Tories lied all the time or bent the truth; so why not "our side" too? Its in a good cause like torture, the ends justify the means. Once you convince yourself that your party should be in power by any means necessary any method will suffice. On the economy my apology would be this: where is the counter factual case? How do you win elections except by a credit boom? Every successful party since the mixed economy was invented has won by credit expansion. All money is credit and all increases in the money supply involves projections about future demand that are not certain but a guess. No Government can be prudent as no Government can predict future demand and productivity growth. But they must win elections. No British Cabinet has ever said no to the city or tried to reduce dependency on finance including tory ones. They play along with the city. Was New Labour any worse than the rest? Now you could argue that Labour should have adopted left wing economic policies that reduce reliance on finance build productive investment and restrict consumption and private debt. But Attlee tried that from 1945 to 1951 and got thrown out for his trouble by the electorate. Too much austerity said the Tories; we want fun! Lets spend no more socialist rationing! In the real world people want to spend and have fun not tighten their belt. Criticisms of Labour in office must be reasonable not based on a unrealistic world view. "the public sector’s financial balance is very largely the mirror image of the corporate sector’s one"
That's very bad news, because it appears that HMG have completely ignored private non-corporate debt. By your (seeming) logic it's important that the government borrow when the (private) corporate sector is stacking up cash balances, but not at all important that they tighten when the (private) household sector is borrowed up to the eyeballs. "for every borrower there must be a lender, and so across all sectors of the economy (which includes foreigners) net borrowing must be zero"
No poo, Hayek ! It's a tremendous comfort to know that while we may import everything, and don't make anything ourselves, across the water other people hold ever-increasing amounts of our debt. "nothing against telling lies for political purposes"
A pity. I hoped to learn from your undoubted knowledge. There are altogether too many people in the UK who think it's OK to use their intelligence and knowledge to exploit (usually financially, but the principle's the same) the unintelligent and ignorant. Sorry to see you join them. Once upon a time that was the sort of thing the Labour Party were against. "It's a tremendous comfort to know that while we may import everything, and don't make anything ourselves, across the water other people hold ever-increasing amounts of our debt"
Do you mean public or private debt? It is good if you wish to borrow that some one will lend to you. The uk does make things, you Laban are engaging in hypebole. We merely make less proportionately than we did. As "the market" decides how much we make that is not a criticism of any Government. If the market in finance works perfectly our creditors must feel we can meet our liabilities or they would not have lent us the money. @Laban Tall "...but not at all important that they tighten when the (private) household sector is borrowed up to the eyeballs." Surely the point is that the private household sector has to deleverage, and therefore public spending needs to rise in compensation. "This said, I’ve nothing against telling lies for political purposes"
Once upon a time that was the sort of thing the Labour Party were against. Still, all in a good cause, end justifies the means and all that. "Surely the point is that the private household sector has to deleverage, and therefore public spending needs to rise in compensation." Is no one capable of looking at all three sectors - public, private (household), private (corporate) simultaneously ? And have you been arguing for government spending cuts over the last 30 years of ever-increasing private indebtedness ? The high corporate surpluses reflect, among other things, that interest rates were far too high. They need to be far lower to induce investment. To you and anybody who thinks 'QE' is simply printing money; it is not. It is basically buying long term bonds instead of short term ones, something the BoE do every day. Yep, it is really that boring. Nothing to do with future generations. Yes QE seems a policy that helps banks but not everyone else. It would be far more effective to actually print money and spend it. Or give it away. Well it depends on what government policy can actually influence and how easily. If corporates are accumulating cash, it's presumably because there are no investment opportunities because of low demand. Now government policy could try to induce more corporate investment (in the absence of demand) but imagine the howls if they did, and they may well be pushing on a piece of string. Successive governments since the 80s have adopted a cuts agenda. Their lazy solution to the demand problem that leaves has been to allow household credit to rise, and the finance sector has been rather pleased to go along with that policy. Demand has still been inadequate, hence our high unemployment rate and below-trend growth rate. But it has enabled the economy to hobble onwards and for the finance sector to become very rich. Now we suffer the consequences of these unsustainable policies. for further details on UK sectoral balances. @ Andy. Thanks. Imagine firms decided to cut investment in order to raise cash. Demand for capital goods would then fall, so firms supplying them would cut jobs and wages. Tax revenue would then fall and welfare benefits rise. These are the automatic stabilizers. In practice, firms that cut investment also try to cut other costs,such as jobs, which adds further to govt borrowing. And sometimes, governments will respond to this by consciously choosing to raise spending to offset the fall in investment. gg - "Now we suffer the consequences of these unsustainable policies." "Successive governments since the 80s have adopted a cuts agenda." 1992-93 43.7% of GDP - Thatcher left, and of course real-term GDP was much higher then, spend nearly tripled in cash terms although there was also high inflation. Sir, I don't see any cuts. 1997-8 38.2% of GDP - those "Major cuts" that I keep hearing people go on about. Still £50bn up in 5 years, in a low-inflation environment. 2007-8, just before the crunch - 41.1%, and in cash terms nearly 80% up on when Blair arrived. After that it REALLY takes off, as Gordon Brown commits huge slabs of national income to rescuing his mates the bankers. b) Thatcher looks like an irresponsible spendthrift aka wise deployer of state investment, depending on your view, in comparison to her successors Major and Blair. Of Brown I do not speak. Many Thanks Chris, I understand the scenario you're referring to- when firms notice demand slowing down, they cut back on investments and this leads to job loss and Government spending on welfare. But is this really what happened during the heady days of 2003-2007? Consumers in the UK back then were going on a spending binge.This should have increased revenues for firms- which meant they didn't need to cut investments to raise cash. They were earning plenty of cash thanks to the credit card maxing out consumer. But the firms didn't re-invest that money, they just hoarded it. These were not recessionary times yet, so why did the Government need to spend/borrow money during those years? Thanks and seriously great blog. chris, "Thanks. Imagine firms decided to cut investment in order to raise cash. Demand for capital goods would then fall, so firms supplying them would cut jobs and wages..."
Only if the BoE don't do their job properly. If they cut rates, then either firms or the government can borrow more at lower cost. Re: the real estate bubble, it shouldn't be addressed with monetary policy. We should have slapped a site value tax on all urban real estate: that would have been an efficient revenue source for local government, while also mitigating real estate speculation. We can go over well-rehearsed arguments if you like. Public expenditure in the UK is low relative to other developed European states. You also need to look at what the money is spent on. Since the 80s there has been a persistent squeeze on local government and social services budgets for example. Instead we pay more money on wars, prisons and unemployment. I'd sooner be spending money more productively on universal childcare. Other European countries seem to manage that. I appreciate your post, see you soon. OK, QE is not money printing. But whatever it actually is, it has two effects: raise in inflation, chiefly by persuading former currency to move to commodities, since fiat currencies are being diluted with extra quantity (but not money printing, oh no no no no no). It also raises GDP. Please explain how GDP is boosted by QE. Personally I think that both here and in the USA we have fudged our way our of recession with accounting tricks. The real issue is that the economic lay of the land has changed, as as a nation we have been poorly governed, and are not as competitive as we could be. Why was my comment deleted, please? PeterM, QE works similar to an interest rate cut or currency devaluation. It raises real GDP by deterring hoarding of money and reserves and slightly lowering the GBP's value in forex markets, thus expanding aggregate demand. Commodity prices change depending on global growth expectations: the UK is a small open economy, so it has negligible effect on these. "The high corporate surpluses reflect, among other things, that interest rates were far too high. They need to be far lower to induce investment." It is rubbish to say fiscal policy "must" have been looser to make up for a lack of private sector investment. Had fiscal policy been *tighter* in 2002 on, monetary policy would necessarily have been looser (to keep growth/inflation in line), and those lower rates would have spurred more private sector investment. Alternatively Sterling could have devalued sooner, reducing the effects of imported deflation on domestic production and manufacturing. The idea that the private sector walked up to the Treasury and forced Brown to run a deficit (at gunpoint?) during a boom is surely beyond farcical.